Kaboo Casino is a brand new online casino launched in September 2015 from the BetIt Group who’s current roster of online casinos include both Thrills Casino and SuperLenny Casino, as such you should be in great hands as both of these casinos are trustworthy great casinos to play at and remain a very popular choice with players. Kaboo Casino’s unique approach to an online casino means that players will experience a constantly evolving adventure, with lots of mission based promotional campaigns from the “The Book of Kaboo”. There are level-based progression systems in place and a unique currency to be earned called Echoes, this allows players to buy the rewards that they desire such as Free Spins for a selection of online slots at a value the player chooses! Echoes are a secondary currency that players can earn whilst playing in the casino, these can then be redeemed for Free Spins. 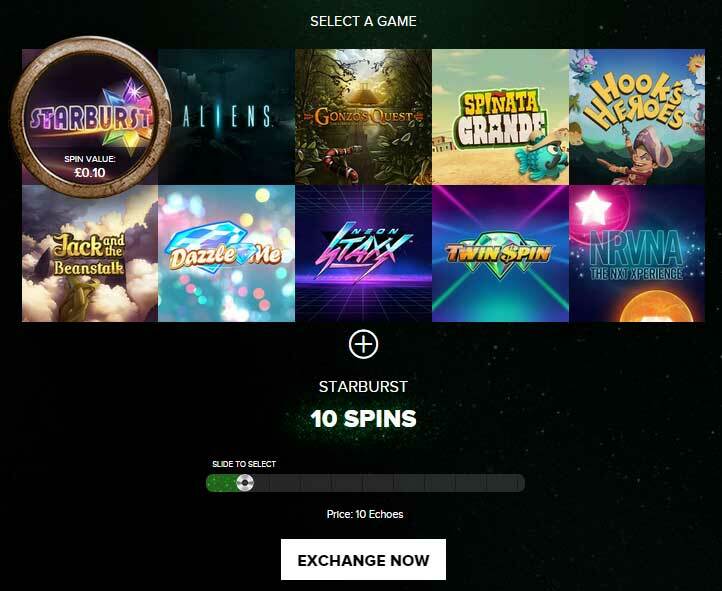 Players get to decide how they want to spend their Echoes, so you can exchange them for lots of lower value Free Spins such as 100 Spins on Starburst at 10 cent spin or redeem them for a riskier 10 Spins on Dracula at €1 spin value. The decision is left up to the player, and even better any winnings from these Free Spins are free from any wagering requirements. 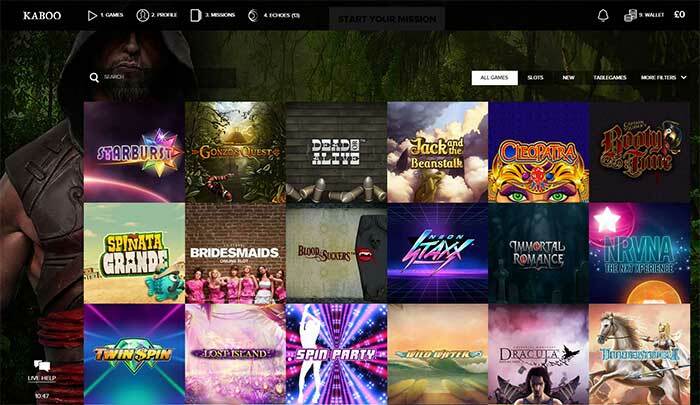 Kaboo currently has a massive range of slots from many providers including NetEnt, Microgaming, Quickspin, IGT, Ash Gaming, GTS, Blueprint, Playtech, Nextgen, Elk Studios, NYX, Thunderkick, Rabcat and PlaynGo. If that wasn’t enough choice they will be adding BetSoft, Yggdrasil and WMS slots to the casino too. New players joining Kaboo Casino will receive at least 5 echoes to redeem on Free Spins of your choosing. You need to wager your first and second deposit bonuses 60 times the bonus amount before you can withdraw the bonus or any winnings gained from bets placed with your bonus balance. Bosnia & Herzegovina, Bulgaria, Czech Republic, China, Croatia, Denmark, Estonia, France, Georgia, Greece, Hungary, India, Indonesia, Ireland, Italy, Latvia, Lithuania, Mauritius, Moldova, Pakistan, Poland, Romania, Russia, Slovakia, Slovenia, Portugal, Spain, Thailand, Turkey, Ukraine & USA. Customer service is available at Kaboo Casino 7 days a week, this is mainly done through a live chat interface, which also has the functionality to attach relevant documents or pictures about an issue. The live chat support is available from 10:00 – 24:00 CET via live chat, phone and Email in a variety of languages including English, Swedish, Finnish and Norwegian. Plenty of payment and withdrawal options exist including, Visa, Mastercard, Neteller, Skrill and Trustly, at a later date further options including iDeal and SOFORT will also be added.